Paper airplanes come in many varieties, and each one will fly differently, depending on how it is folded and the aerodynamics of the plane. A boomerang paper airplane is a plane that--as its name suggests--acts like a boomerang. It flies away and then right back at you. 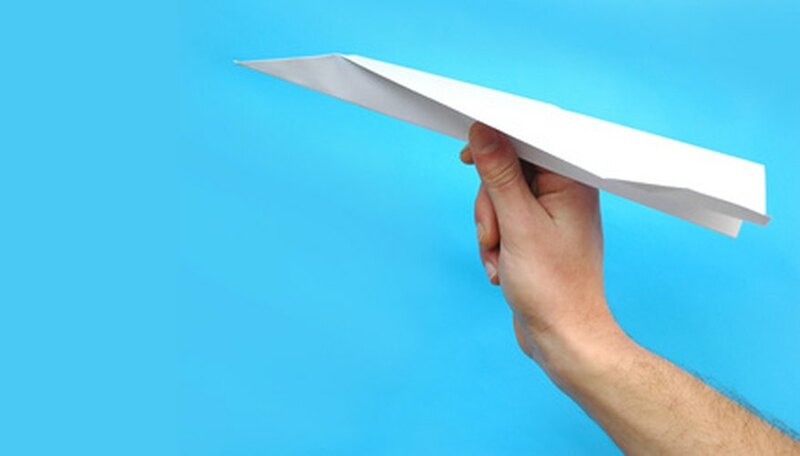 A simple boomerang airplane can be made out of a single piece of paper. Lay an 8.5-by-11-inch sheet of paper on a flat surface. Fold it in half vertically. Crease and unfold the paper. Fold the two top corners inward to meet the center crease, forming two triangles. Fold the top point down, creating a larger triangle. The edge of the new triangle should be about 1/2 inch from the fold, so that it looks like the top of an envelope. Fold the two top corners to touch the center crease. These folds should be at an angle, so that the corners touch the center but the fold corners (at the top of the paper) do not. Fold the small triangle near the bottom of the paper up. The fold should be up against the top layers. Fold in the left and right sides of the paper to meet the center crease, forming two parallel, vertical folds. Fold each side wing back outward, about 1/2 inch from the last folds. Take the entire plane and fold the top portion of the wings inward, so they line up with the center crease. They will form narrow triangles all the way down to the bottom of the plane. The bottom wings will not line up along the center. Fold the wings back along the middle crease. Lift the wings so they are ready to fly.